Let’s start with your best buddy in the class who sits beside you in the classroom, your partner in crime. He/she helps you in need and gets help from you in his/her need. He/she is the one who fights with you for your tiffins, video-games, movies, etc. and wanders, play and have fun with you around the school campus. Every best buddy has two sides of his/her personality. One side of the personality companies you in your fun, good and bad stuff and the other side of the personality, makes yourself the fun thing & I have faced a lot of these two sides. One of the most memorable classmate is the monitor of the class. In our school, the selection or election of your monitor was not mandatory but the teacher used to pick one from us who used to be good in studies or discipline. His/her work was to report the names of the indisciplined students in the class in the absence of the teacher or to collect the homework and assignments from the students and submit to the teacher. Sometimes it used to be fun when your close one is the monitor. I remember when of my friends was monitor and he used to give a few warnings more than the others while we used to talk or do something which was not required in the class. The classmate is always the favorite, who has his/her birthday on that day. The reason is very much simple and selfish. It’s that we got to eat chocolates given by him/her in the morning and the treat used to be more than just chocolates if that classmate is our very good friend as he/she used to pay for the food at the school canteen in the recess whatever we close friends used to eat that day. The one whom you want to see every day when you reach the school. The one brings a smile to your face when he/she is present that day or make you sad if he/she is absent that day. The one with whom you want to talk and have a friendship. The one who becomes more than a crush or just remains your crush but anything that happens, we should leave it there and we should go for the other things ahead in our life. A classroom is nothing without classmates. 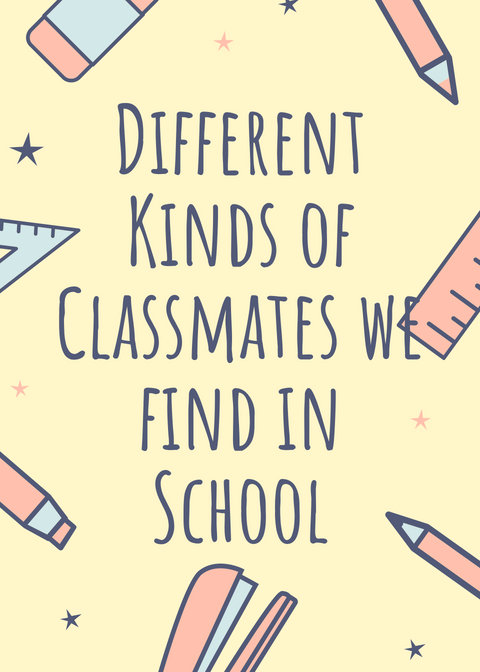 Every classmate has his/her own and unique specialties but the above mentioned are the ones whom I think are the most common and memorable in my opinion. Thanks for bringing back the School memories.